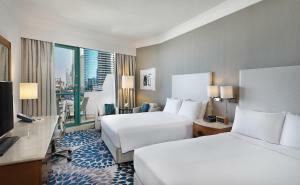 This 5-star Hilton resort is located on Dubai's The Walk at Jumeirah Beach Residence, offering endless shopping, dining, and leisure activities. Its swimming pool is set within palm tree gardens bordering a private beach with sun loungers. Free WiFi is available in public areas. 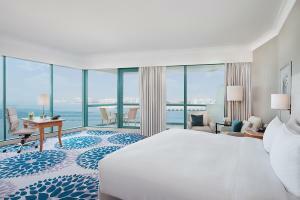 A range of water sports opportunities are on offer on Hilton Dubai Jumeirah’s private beach. Guests can also work out at the well-equipped gym or enjoy one of many body treatments in the spa area. Young guests can have fun at the kids' club and playground. The award-winning BiCE, one of the hotel's 15 restaurants, is located on the 10th floor serving Italian cuisine and cocktails at its Sky Bar with outdoor terrace. Other dining options include an all-day dining restaurant and the Dubai's popular Irish bar and restaurant McGettigan's at the lobby level. Dubai Marina Metro Station is a 10-minute walk from the hotel, and daily shuttles are available to several malls, including the Mall of the Emirates and BurJuman. Free on-site private parking is also available. 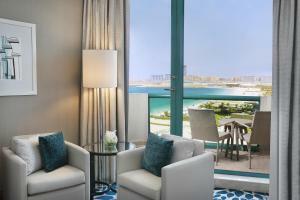 Hilton Dubai Jumeirah guarantees interconnecting rooms upon request at the time of booking. This modern room is decorated in warm colours, and has partial views of the sea. It includes a work desk and a balcony (subject to availability). Each has a marble bathroom with a bathrobe and free amenities. This modern room is decorated in warm colours, and includes an extra large bed. It includes a work desk and a balcony (subject to availability). Each has a marble bathroom with a bathrobe and free amenities. This modern room is decorated in warm colours, and has 2 large beds . It includes a work desk and a balcony (subject to availability). Each has a marble bathroom with a bathrobe and free amenities. This modern room is decorated in warm colours, and has partial views of the sea. It includes a work desk and a balcony (subject to availability). 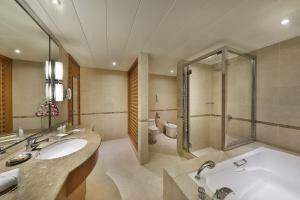 Each has a marble bathroom with a bathrobe and free amenities. 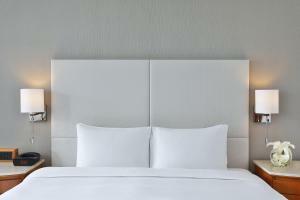 Please note that this room can accommodate 2 adults and 2 children in existing beds. This modern room is decorated in warm colours, and offers various executive benefits. 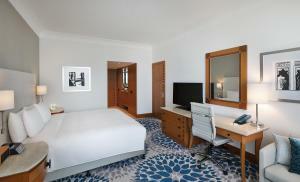 Each room comes with two queen size beds and a marble bathroom with a bathrobe. Executive lounge guests enjoy complimentary breakfast, afternoon tea, evening drinks and canapés. The executive lounge is located on the 9th floor with floor-to-ceiling windows offering a spectacular view over the Arabian Gulf. Personal computers for guest use. Complimentary wireless Internet access. Opening hours are from 18:00-21:00. Featuring a balcony with a sea view (subject to availability), this air-conditioned room offers a flat-screen TV, a minibar, an electric kettle and an en-suite bathroom with a bath. 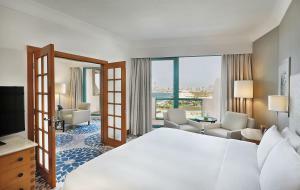 Featuring 2 balconies with Arabian Gulf views, this spacious suite includes Lounge access with executive benefits, large windows, separate living area. Stay productive at the desk using WiFi (fees apply), or unwind in the separate living room with an on-demand movie. 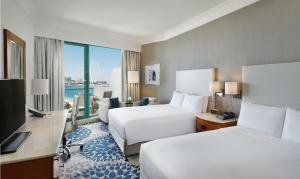 This spacious suite features two bathrooms. A rollaway bed is available on request. 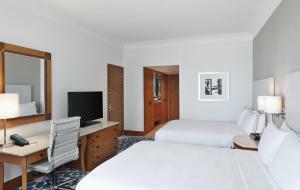 Executive level guests enjoy exclusive access to the hotel's Executive Lounge, serving complimentary breakfast, drinks and snacks throughout the day plus private check-in and check-out. Rooms are 39 square metres.